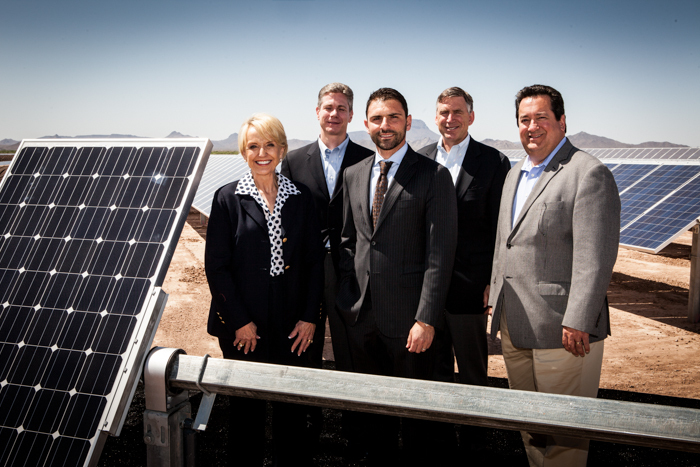 A massive, 127-megawatt solar power installation was officially opened in Arizona last week. Block 1 (of 5) of the Arlington Valley Solar Energy II (AV Solar II) utility-scale installation is located in Maricopa County in southwest Arizona on about 1,160 acres of land. The rest of the power plant / solar farm will be completed by the fourth quarter of 2013 — one of the beauties of solar power plants is the speed at which they can go up. Kyocera, one of the world’s biggest solar module manufacturers, has supplied 25 MW of solar panels for the project. Kyocera is a Kyoto-based company. However, it has US headquarters in Arizona.